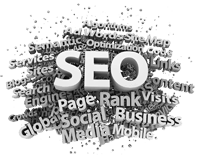 We offer a range of Organic SEO Packages, AdWords Campaigns, and online Marketing Services which will greatly increase your search engine rankings. Our goal is to drive increased traffic to your website that produces cost-effective conversions, thereby maximizing your return on investment (ROI). We can provide your business with an Internet Marketing Campaign Package best suited to your needs, that will totally optimise your web presence. Your website can also be optimised to include Google’s Webmaster Tools, Google Maps integration, AdWords Campaigns, and Google Analytics reporting. We include accurate researched Meta keywords and description tags to specifically target your major products and services. Depending on your current individual requirements, you can choose from one of our following Packages. This package is recommended for a small business that has just set up or needs a better web presence than you have currently. This package is recommended for medium sized businesses that are now looking for a serious web campaign to vastly improve their internet presence. This package is recommended for medium to large enterprise businesses that are ready to give their web presence the maximum impact. Today, SMO allows you to promote your business using all Social Media Networking including LinkedIn, Facebook and Twitter. A researched AdWord Campaign will provide instant page one search ranking results, and can be set-up to target all your major markets. Please contact us to discuss your future requirements.